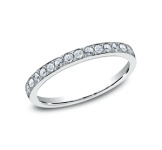 The unique textured finish of this 7mm comfort-fit Tungsten band is beautifully framed by slight high polish edges. Inspired by the Dogwood tree, this 7mm Tantalum ring features a bark motif highlighted by slight high polish beveled edges. . 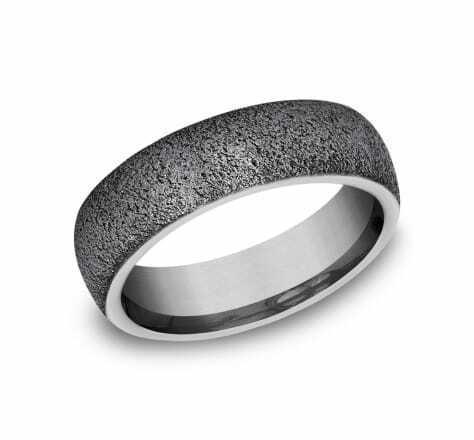 This 7mm Tantalum ring features a Lava Rock texture framed by slight beveled edges. 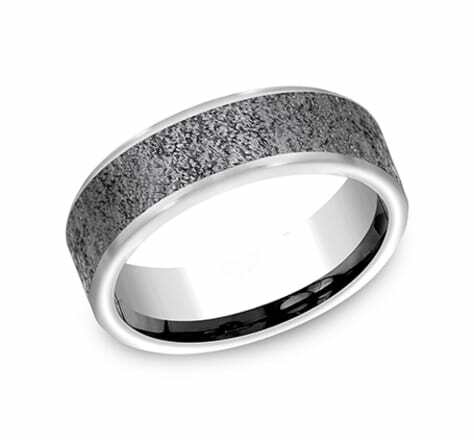 Slight drop bevel edges embrace the dimensional web effect created by wear resistant black detailing on this 7mm Tantalum design ring. The wear resistant black detailing on this 6.5mm Tantalum ring creates a beautifully organic diagonal bark design. Channeling the motifs of the Ottoman Empire, intricate design work gives this 8mm comfort-fit Tungsten ring a uniquely elegant look. This 7mm Comfort-Fit Tantalum wedding ring channels rugged beauty with its fractured rock design. Inspired by the Victorian era, this 7mm comfort-fit ring features two colors of Tantalum and a beautiful floral motif. 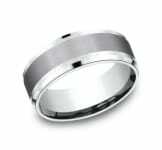 This vintage inspired 7mm comfort-fit Tungsten ring features a floral script detail. Inspired by nature, this Tungsten 7mm comfort-fit ring features a beautifully organic leaf pattern. 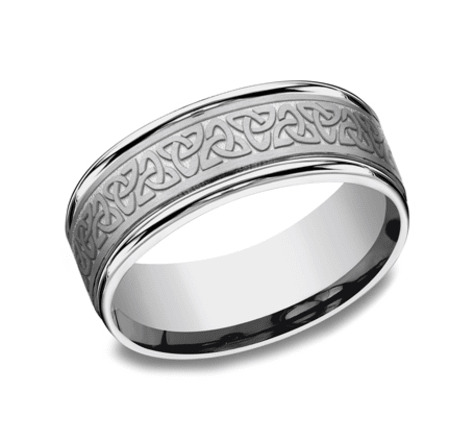 This Tungsten design band features the iconic Celtic Knot amidst high polish drop bevel edges. 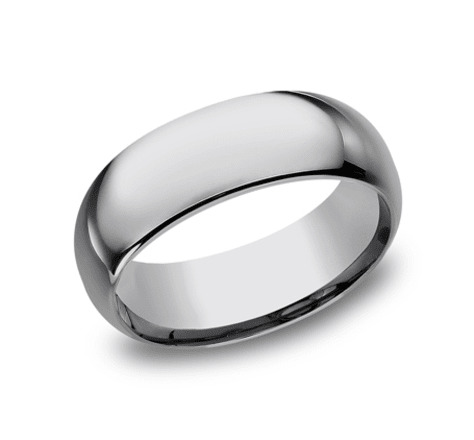 This Grey Tantalum 6.5mm Comfort-Fit band features high polish round edges and a swirl fiberglass finish on the center. 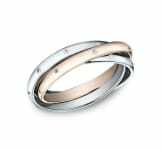 This Titanium comfort-fit 6mm satin-finished band features a high polished edge that offers not only great style, but remarkable strength and durability. This popular 6mm comfort-fit Tungsten band features a satin-finished surface with a high polished round edge that exemplifies subtle, yet impeccable style. 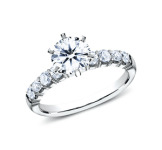 This cool 6mm Tungsten band features a comfort-fit on the inside and resembles a more traditional look. This 6.5mm Tantalum design band features a swirled textured finish for a sleek contemporary style that is sure to please. We've created this horizontal bark 7mm comfort-fit ring using two colors of Tantalum but a beautifully organic two-tone effect. We've married two colors of our Tantalum on this 7mm comfort-fit design ring to create a unique twist to a classic style. Beautifully unique, this 8mm comfort-fit band has a satin finish Tantalum center cradled in high polish drop beveled edges. 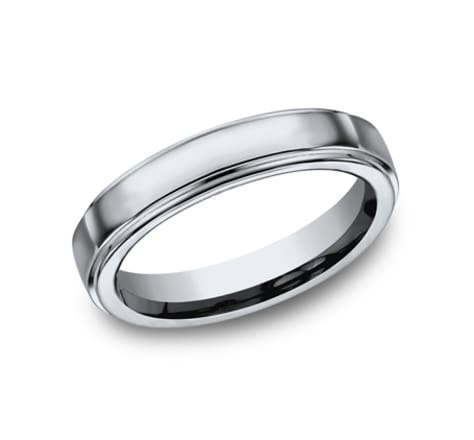 The subtle two tone effect on this 7mm comfort-fit wedding ring is created using two colors of our Tantalum. The gorgeous swirl finish adds a surprising detail. A random cross hatch pattern creates a uniquely one of a kind finish on this Tantalum 6.5 mm comfort-fit design wedding ring. 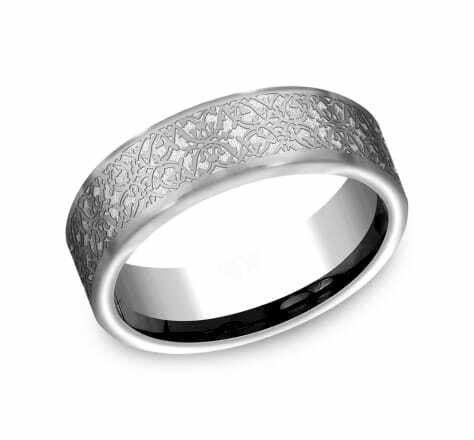 Mixing classic and contemporary, we've re-created our most loved 7mm round edge comfort-fit style in Damascus Steel. The unique glass finish on this 6.5mm comfort-fit Tantalum design ring crates one of a kind texture and modern feel. The wear resistant black detailing on this 6.5mm comfort-fit Tantalum design ring highlights the unique horizonal bark motif. Inspired by nature, the beautifully organic leaf pattern on this Tantalum 6.5mm comfort-fit ring is created using a wear resistant black coating. Framed by high polish beveled edges, this 7mm comfort-fit Tungsten band has a satin finish and a high polish center cut detail. This Titanium 8mm comfort-fit satin-finished band features two high polished parallel grooves along the center. 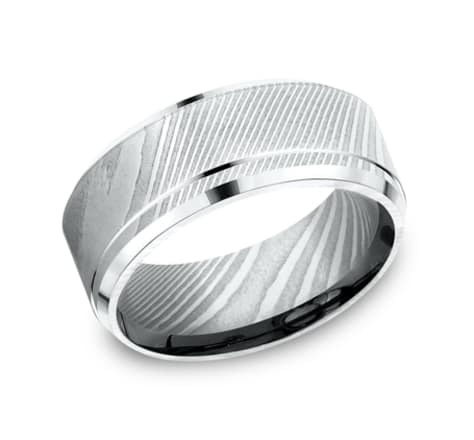 The high polish concave cut on this 7.5mm comfort-fit Damascus Steel ring creates an interesting detail on a classic profile. An industrial interpretation on one of our best selling designs, we've recreated our 7mm comfort-fit round edge design ring in Tantalum with a beautiful wire brush finish. Representing the timeless nature of love, this 6.5mm Tantalum band features an endless Celtic Knot pattern. 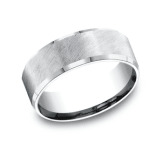 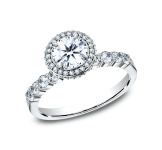 This 8mm comfort-fit Tantalum ring showcases a swirl finish wrapped in high polish drop bevel edges. This 8mm comfort-fit Damascus Steel ring features rounded edges and a center cut for a contemporary look on a classic style. This Grey Tantalum design band features a unique satin finished cracked pattern. This awesome Grey Tantalum 7mm comfort-fit band features an exquisite Celtic knot repeating pattern along the center of high polished edges for unforgettable style. 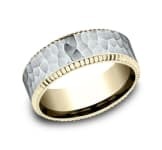 This awesome Grey Tantalum 8mm comfort-fit band features an exquisite mock leather pattern along the center of high polished bevelled edges for unforgettable style. This Grey Tantalum design band places a new emphasis on modern style with a wired finish. This incredible 9mm comfort-fit and powder coated finish Damascus Steel band features a high polished "stair-step" style edge. This Grey Tantalum 7mm Comfort-Fit band features high polish bevelled edges and a wired finish on the center. This Grey Tantalum 7mm Comfort-Fit band features high polish bevelled edges and a swirl fiberglass finish on the center. This Titanium 5mm comfort-fit high polished band not only has the extraordinary look of a traditional band, but offers great strength and durability. 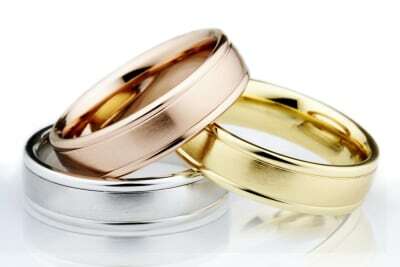 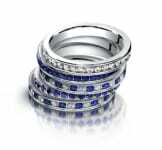 This cool 8mm Tungsten band features a comfort-fit on the inside and resembles a more traditional look.